Actual website created in photoshop using slices. Wish I had a host so that if anyone actually read this, could actually go around clicking. 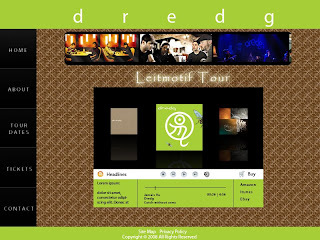 My animation is simply a rolling banner at the top with the pictures of the band. Wanted to avoid something too flashy, so I just made a banner at the top. I had originally put in 500 frames to tween, but my computer absolutely refused to process that kind of information. So I just set it to 50 and all was well, just a bit laggy, but for this purpose, it did what it had to do. They have a very rustic, acoustical natural, yet progressive sound about them. I wanted to convey that somehow, so I went with rather earthly tones and got the green off their "Catch Without Arms" album, put in some nice hard edges and classic matte buttons to give it a clean look which I thought exemplified this band. 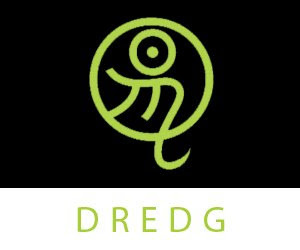 Everything here was designed by me (obviously), except for the logo and dredg albums. Did the buttons, pattern at the back, as well as the layout, text, etc. Leaderboard banner, has animation like the rest of these do, but blogger doesn't accept animated gifs, unless you go through a host like photobucket. Incase something happens to my photobucket, I'd like all my info to be here and not get those dreaded "this image has been moved or deleted", so I uploaded final jpeg images.